**HOT!! ** $2 Speed Stick Gear coupon! HURRY AND PRINT IT BEFORE IT DISAPPEARS! On your cell phone? Click the picture and have it emailed so you can print it later! 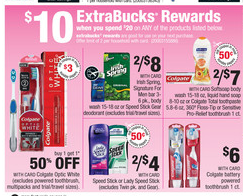 At CVS - Speed Stick Gear is part of the buy $20 and get $10 reward deal! You can mix and match this deal with any of the product's listed.